Spring is the best time to prepare dolmadakia, when vine leaves are young and fresh. I’ve been lucky to have access to homegrown and organic tender, young vine leaves, and once you’ve used the best, its difficult to use the preserved varieties. So how to prepare this classic Hellenic dish? It’s very simple, a little time consuming, but its definitely worth it! Here’s a little video of me preparing dolmadakia that you might enjoy! Heat the olive oil in a medium sized saucepan and saute the onion until soft and transparent. Add the rice, stir, and cook for a couple of minutes. Add the herbs, and season with salt and pepper. Continue stirring for a minute before adding the hot water. Stir well, bring to the boil, reduce heat and cook for approximately 5 minutes. Turn off the heat and place a lid on the pot. To prepare the vine leaves you will need a large stainless steel bowl half filled with boiling water, and another stainless steel bowl filled with cold water. Place around 5 leaves at a time in the hot water first, and press down gently to ensure they are covered. As the leaves change colour which may take 3-5 minutes, remove the leaves gently and place into the cold water to stop the cooking process. Take each leaf and drain over the edge of a colander that has a large dish beneath it to catch the drips of water. Repeat until all leaves have been prepared. With the smooth side down, and the stem side towards you, place the vine leaf onto a large plate. 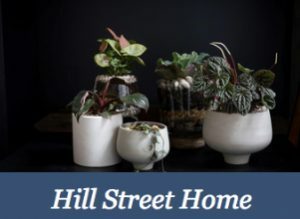 Place a heaped teaspoon of the mixture horizontally onto the leaf, and fold in the end with stem, roll once again, and then fold in the sides, and then gently roll to form a nice little parcel. Line the bottom of a saucepan with 3 layers of baking paper or a heatproof plate that fits snugly and place the dolmadakia on top fitting them in nice and tight. Continue rolling until all leaves are used up. Drizzle with approximately 1/4 cup olive oil, gently pour over 3/4 cup hot water, and then finish with the juice from half a juicy lemon. Then top with an inverted plate to keep the dolmadakia from moving around in the pot. Place lid on pot and take to the stove top, bring to the boil, then reduce heat and cook for approximately 1 hour or until rice is cooked. You’ll need to have a little sneak peak. When ready, turn off the heat and leave the pot to sit until completely cool and all the liquid has been absorbed. Dolmadakia usually taste better the next day, so if you can resist, when they have cooled put them onto a serving plate and place in the refrigerator. Enjoy with a dollop of Greek natural yoghurt, a bowl of kalamata olives, wedges of tomatoes, slices of cucumber, some continental bread, and wash down with a crisp white wine. I’m just feeling so thrilled. Truly, I am! Greek Life has moved into new states, and the latest one to be added is Tasmania. 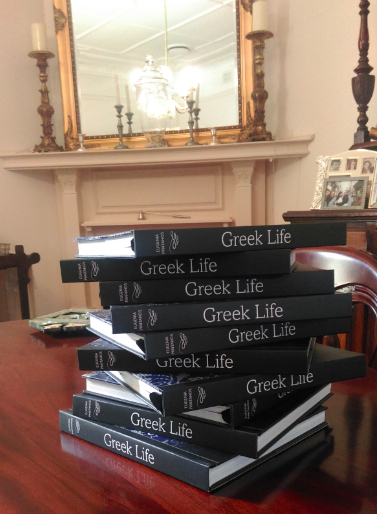 The lovely people of Hobart can now get their hands on Greek Life. It’s a beautiful and meaningful book for anyone for whom Greek culture means something; the foodies, the travelers, the cooks, the coffee table book lovers, and of course those who simply love all things Hellenic. Within its pages you will be taken on a journey of discovery as the story of family unfolds and then continues with the beautiful and unique traditions, culture, and of course the mouthwatering food prepared when observing these cultural traditions. Your mind will be stimulated with thought inspiring philosophy (a little mind food), and the photography will transport you to some intimate and unforgettable experience within your heart and soul. Greek Life has been acclaimed as the highest quality book on Greek culture by many of my readers. It sits proudly in homes in Australia and beyond in all corners of the globe. 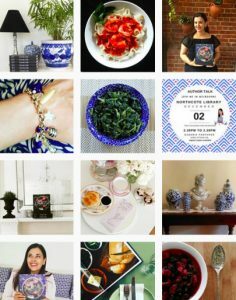 It is more than a cookbook, it is an anthology that brings to life the stories around recipes and why its so important to preserve them. Tasmanians, I know that you will love Greek Life as much as your counterparts do in this beautiful country we call home. Be inspired by what my readers are sharing with me. Join the celebration that is Greek Life. Now in limited supply, this hardcover book is a beautiful gift for the special people in your life. You won’t want to miss out, so now’s the time to visit the Hill Street Grocer in Hobart, to get your copies. Local is the new black! This afternoon, is just one of those afternoons, when you crave something a little sweet, and a little bit healthy. 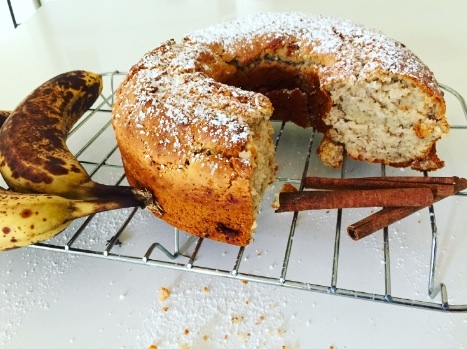 With two overripe bananas in the fridge just waiting to be used up, Banana Cake, seems the natural option. This fluffy Banana Cake has a good measure of cinnamon to add some spice to the sweet ripe bananas, as well as some soaked shredded coconut. Modified especially for Lent, I’ve used non-dairy milk, a touch of apple cider vinegar to replace egg, and sunflower oil instead of butter. You’ll love this aromatic cake as an afternoon treat and to share with your family and friends! Place a sieve over a mixing bowl and sift the dry ingredients. Add caster sugar and mix through. Separately mix together the milk, apple cider vinegar, sunflower oil and vanilla essence. Add this to the dry ingredients together with the mashed bananas and soaked shredded coconut. Mix gently before placing into a greased cake tin. Bake in a moderate oven for about 40 minutes, or until cooked through. Let stand for 15 minutes before turning out onto a baking rack to cool. I love sharing new recipes with you, and I think this one is going to be a new family favourite! 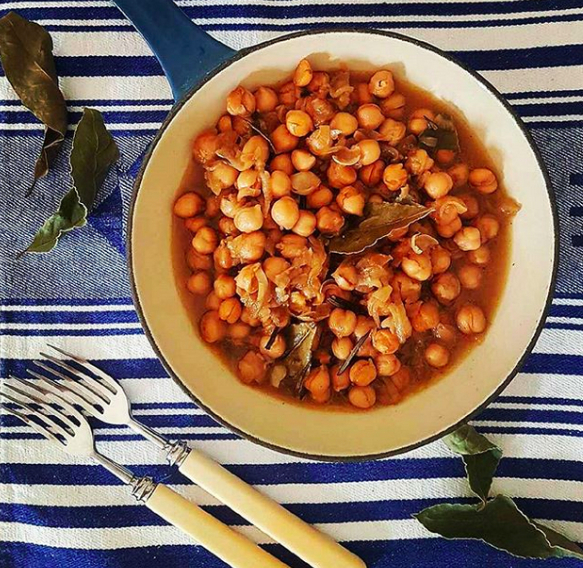 A slow cooked delight of caramalized onions and buttery chickpeas. 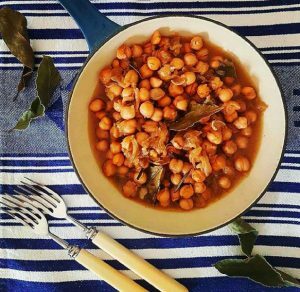 This chickpea dish is equally delicious and nutritious with thinly sliced caramelized onions that add a certain sweetness to the buttery chickpeas. A slow cooked delight infused with a touch of earthy rosemary and aromatic bay leaves harvested from my garden. Unless you grow your own bay leaves, or have family, friends or a generous neighbour that gift you some, you’ll never know what you’re missing out on. The flavour is deeper and more aromatic and these air dried leaves truly bring your dishes to life! Chickpeas are a great source of protein for vegetarians, vegans, and for those observing lent. So now is a great time to enjoy the healthy and nutritious benefits of adding legumes to your diet, if you don’t already do so. Serve with fresh continental style bread and a simple side salad of cos lettuce drizzled with extra virgin olive oil, a splash of white vinegar, and a sprinkling of dried mint. A perfectly fresh salad to accompany the richness of the braised chickpeas. Gently heat the olive oil in a heavy based saucepan, and add thinly sliced brown onions. Cook slowly over low heat for approximately 10-15 minutes until onion is soft and has collapsed. Stir in sugar and balsamic vinegar to deglaze the pot. Add rosemary, bay leaves, chickpeas, and hot water. Bring to boil, and then reduce to simmer, until chickpeas are tender and liquid reduced. Season according to your taste. I’ll have a copy of Greek Life with that! Pick up a copy of Greek Life with your groceries! You can find Greek Life sitting proudly at many high quality stockists in Australia including the award winning Frewville and Pasadena Foodland stores here in South Australia. 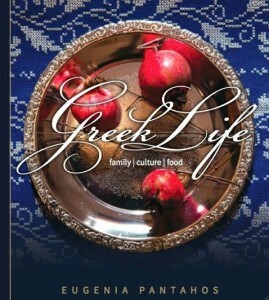 Greek Life – now available in store at Frewville and Pasadena Foodland stores. For the second consecutive year these fine supermarkets have been recognised and awarded the much coveted title of International Retailer of the Year. I extend my heartfelt congratulations to Nick Chapley and his team. I’m proud to have my book Greek Life stocked at these iconic stores, and whether you’re buying Greek Life for yourself or as a gift, you will find them especially gift-wrapped to keep your copies safe when shopping. Greek Life is a celebration of family, culture and food, and at the core are the principles of the highly regarded Mediterranean Diet, or as I like to call it, the Mediterranean Lifestyle. 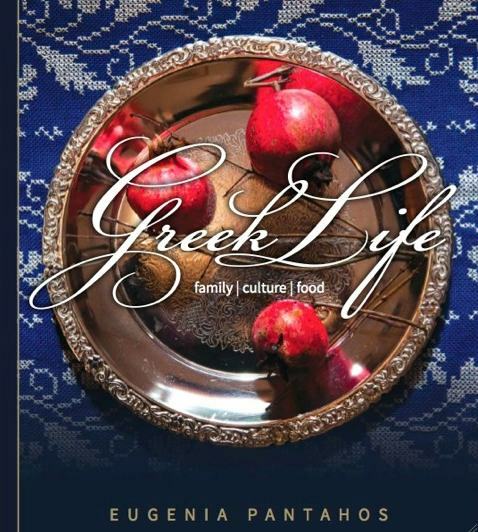 Unique and inspiring, Greek Life commences with the story of family and continues with thought inspiring philosophy, beautiful full colour photography, and authentic family recipes that are prepared when observing cultural traditions. Greek Life is the perfect gift for Easter, so when you stock up on your chocolate Easter eggs, let the staff know that you’ll like Greek Life with that! The Greek way of life is otherwise known as the Mediterranean Diet or as I like to call it the Mediterranean ‘lifestyle’. This particular way of eating means that most nutrients are sourced from vegetables, pulses, nuts, seeds, fruits, and grains. Food is prepared using fresh seasonal ingredients, and that means there is a wonderful rhythm to planting, growing, harvesting, cooking, and enjoying traditional Greek cuisine. Recently I’ve spoiled my family with a delicious and nutritious vegetarian / vegan / lenten pita (pie) made with nutritious spinach leaves that are rich in antioxidants and a great source of A, B2, C and K. Spinach also contains magnesium, manganese, folate, iron, calcium and potassium; in other words it’s a great addition to our everyday diet. The spring onions add a lovely mild flavour and it all comes together beautifully with the addition of fresh herbs and a little par-boiled rice which may call for an extra sprinkling of salt (that’s my preference), but its best to season to your taste. The addition of the par-boiled rice absorbs any moisture released from the spinach during the baking process. 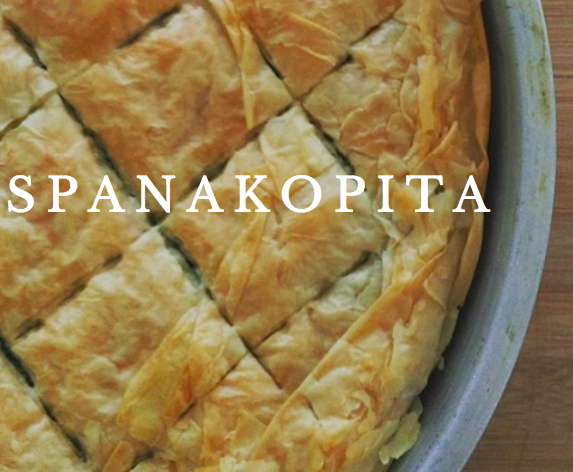 The result is a flaky Spanakopita, with a delicious filling that is simply irresistible. Our family hasn’t had leftovers yet, but I’m certain it will keep well! Here’s the recipe for my divinely delicious Spanakopita! Heat the olive oil in a large frying pan, and saute the spring onions until soft. Add the drained spinach, and cook until wilted. Add herbs, season with salt and pepper, and mix thoroughly. Remove from heat and allow to cool before adding the par-boiled rice. Now it’s time to prepare the pie dish. Grease a round ‘pita’ dish, or other shallow baking tray with the melted Nuttelex. Place a sheet of phyllo, brush with Nuttelex, before placing another sheet on top. Ensure that some of the phyllo hangs over the edges of the tray. Repeat until 10 sheets cover the base of the tray. Add the rice into the spinach mixture, and be sure to mix well, before placing this filling into the dish. Smooth the spinach mixture to the edges of the tray. Continue with another 8 sheets of phyllo brushed with Nuttelex. Brush the overhanging edges of pastry with melted Nuttelex, and then proceed to fold them in at an angle to form a crust around the tray. Using a sharp knife proceed to lightly cut the top layers of pastry into squares and then using your fingers ‘splash’ some water on top of the Spanakopita. Bake for approximately 30 -45 minutes, depending on your oven.